South Louisiana was built by the changing course of the Mississippi River. Sediment was deposited by the River and reworked by tidal- and wave-driven forces to build the Delta in the southeast portion of the state and the Chenier Plain in the southwest1. The contemporary Mississippi River Delta, located in Plaquemines Parish, extends out into the Gulf of Mexico. The diverging passes of the Mississippi River inspired the name Bird’s Foot Delta for the region (also referred to as the Balize Delta). The Chenier Plain, with alternating beach ridges and marshes, extends from roughly Vermilion Bay to Sabine Lake, covering much of Vermilion and Cameron Parishes2. The landscape of southern Louisiana is not static, but rather continuously evolving through a process called the “delta cycle.” Every 1000-2000 years, the Mississippi River changes course, abandoning one main channel as it fills with sediment and switches to a new channel to build another delta somewhere else along the southeastern coast of Louisiana1. This process has created a lush landscape of plentiful natural resources and network of rivers and bayous allowing people to travel through the swamps of south Louisiana. However, it is also a landscape in which frequent flooding is common and no river or landform is permanent. The history of flood control in south Louisiana is a story of both successes and failures as humans have attempted to assert control over nature and settle in a dynamic environment. Since the time the French began colonizing the New Orleans area, humans have been trying to contain and control the Mississippi River for flood protection and ease of navigation3. The first substantial artificial levees were erected in New Orleans in 17224, and the expansion of levees in south Louisiana has continued to the present. Despite improvements in navigability and reduction of river flooding, these actions have had serious unforeseen consequences, including high rates of subsidence, saltwater intrusion into wetlands, and land loss along the coast. Attempts to make living in the Mississippi River Delta safer and more convenient have also put people in great danger from the effects of climate change, including sea level rise and powerful tropical storms5. The flood control methods used since the 18th century have greatly constrained the ability of the Mississippi River to build land. Historically, the floodwaters of the Mississippi River distributed sediment and nutrient-rich freshwater across the marshes and swamps of the Mississippi River Delta by overtopping or breaking through natural levees5. When rivers overtop their banks, spreading floodwaters immediately decrease in velocity and drop the heaviest, largest sediments close to the river banks, building up natural levees, while finer particles of silt spread further out, nourishing the backswamps1, 6. Periodic, low-intensity flooding led to the vertical accretion of land, allowing the naturally subsiding Mississippi Delta region to stay above sea levels7. These floodwaters, while ecologically vital, proved inconvenient (and occasionally catastrophic) for European settlers. The colonial French government required property owners to construct their own levees in a law passed in 1724. However, that system of flood control proved ineffective so local governments later became involved in levee building. To share the cost of building and maintenance among residents, local levee districts were formed to collect taxes, but costs exceeded revenues. In 1850, the federal government passed the Swamp and Overflow Land Act which gave 8.5 million of acres of swampland along the Mississippi River to the state of Louisiana. The state then sold the land to pay for levee construction, not knowing that the swamplands provided protection from flooding through their ability to detain floodwaters6. Even with longer and higher levees, disastrous floods continued, as the river was running higher than ever measured since the founding of New Orleans and numerous crevasses, or breaks in the levees, formed during flood events6. This provoked the direct involvement of the federal government and the formalization of a “levees-only” policy for controlling the Mississippi River in the late 19th century8. Following the formation of the federal Mississippi River Commission in 1879 and its implementation of a “levees-only” policy in 1885, the river was effectively cut off from its natural flood plains9. The natural distributaries of the Mississippi River – most notably Bayou Lafourche in 1903, which was the main channel of the Mississippi River only 800 years ago1 – were dammed in the beginning of the 20th century9. The insertion of expansive flood control infrastructure resulted in a system whereby river water bypasses the wetlands and deposits sediment off the continental shelf, preventing land building in the Delta9. Despite efforts to control the Mississippi River with levees six times higher than those built by the French colonists, flooding from overtopping and breaching continued6. The largest flood ever recorded on the River happened in the spring and summer of 1927. Levees broke in 246 places in the lower Mississippi Valley, inundating 27,000 square miles of land, displacing 700,000 people, killing 1,000 more (246 in the New Orleans area), and damaging or destroying 137,000 structures8. The flood prompted the passage of the Flood Control Act of 1928 and the creation of the Army Corps of Engineers’ Mississippi River & Tributaries Project (also known as the “Jadwin Plan”). The Jadwin Plan called for better constructed and continuous levees, a series of bypass floodways to accept excess flow during high water events, channel improvements to stabilize river banks, and tributary basin improvements wherever possible. The plan marked the beginning of America’s contemporary flood control methods, components of which still exist today8. Notable flood control projects that followed the passage of the Flood Control Act of 1928 include the construction of the federal levee system, Bonnet Carré Spillway (1933), Wax Lake Outlet Diversion (1944), Morganza Spillway (1954), and Old River Control Structure (1963)8,9. Artificial channelization through the federal levee system has disrupted the natural processes of deltaic land building with severe consequences. 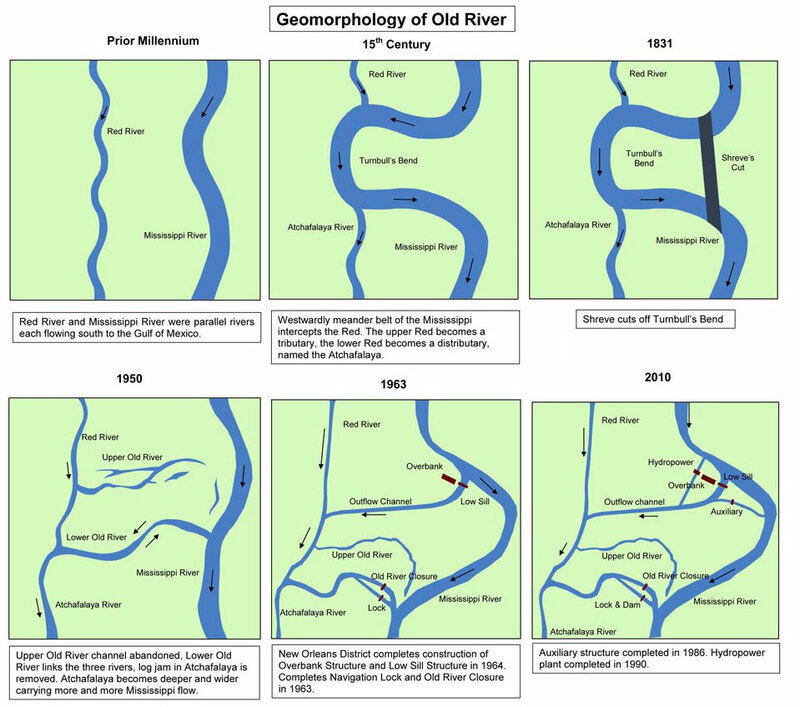 The decrease in sediment reaching the delta has ultimately resulted in the early arrival the geomorphologic end-phase, or abandonment, of the entire Bird’s Foot Delta. This has been followed by rapid subsidence-driven subaerial delta deterioration1. In 1973, the Mississippi River almost broke through the Old River Control Structure, which would have caused the river to switch its course to flow through the Atchafalaya Delta. However, the structure held and the flow continues to be controlled to allow no more than 30% of the Mississippi River flow through the Atchafalaya River6. Evidence of the formation of a new delta lobe is appearing as the Wax Lake Delta and Atchafalaya Delta have continued to grow since the flood of 19736. Without highly-engineered structures such as the Old River Control and the federal levee system, the Mississippi River would change course and continue through the Atchafalaya Basin1,6. Overall decreases in the sediment load of the Mississippi River continued throughout the 20th century into the present, largely due to upriver dams that trap sediment in reservoirs and erosion control measures decrease the amount of soil washed into the river10. Only 19% of total suspended sediments in the river south of Old River Control structure make it to the Gulf of Mexico, as most sediment in the lower reaches of the river are deposited on the bank or river bottom during flooding events11. Without a large sediment load, the river cannot continue to build a delta. Slowly, the coastal landforms subside and erode into barrier islands1. Sea level rise and human-induced hydrologic modifications9, including the construction of pipelines and navigation canals to support the oil and gas extraction industry, will further contribute to land loss as saltwater intrudes into freshwater marshes. As freshwater plants die off, the soil becomes destabilized and the land erodes. Collectively, more than 1,787 square miles of Louisiana coastal wetlands have been lost since 1932, with the highest land loss rates occurring in the 1970’s12. The rate has decreased since then, due in part to federal regulations, an increased understanding of the importance of the deltaic environment, and a better understanding of the potential impacts of hydrologic modification. Unfortunately, Louisiana is still far from building more land than it loses. However, our understanding of the causes of wetlands loss and the potential for coastal restoration have been greatly enhanced through research and development conducted at the state’s higher education institutions and various state and federal agencies. A strategy for coastal restoration that is being heavily promoted by the State is the use of diversions. River diversions are engineered structures that divert water and sediment from the main river channel through gate structures (or pumps) and feeder channels to receiving basins (i.e. lakes, bays) or wetlands13. Spillways operate in a similar manner. The Bonnet Carré Spillway, Morganza Spillway, and Was Lake Outlet were designed to decrease river stage and reduce flooding threats to major cities down river, including New Orleans and Morgan City. Today, diversions are being designed to mimic the processes of natural crevasses to build new wetlands. Previous research has shown that these small river diversions can increase marsh primary production, wetland surface elevation, and vertical accretion14. The operation of the Morganza Spillway and emergence of the Wax Lake Delta have resulted in significant new land building in the Atchafalaya Bay1,6. Some existing spillways and diversions, however, have directed freshwater, nutrients, and sediment to areas where the benefit to the natural environment is disputed. While freshwater from the Bonnet Carré has helped maintain the cypress swamps around Lake Pontchartain14, the opening of the spillway during flood events also increases nutrient loads and can lead to harmful algae blooms in the spring and summer15, representing the tradeoffs between sediment and freshwater delivery to dying wetlands and negative impacts to water quality that must be considered when operating river diversions and spillways. The introduction of freshwater has also been found to temporarily disrupt some aquatic animal populations in the Lake that thrive in moderately saline water16,17. Additionally, the vast amounts of sediment that are deposited into Lake Ponchartrain during spillway openings represent a lost opportunity as that sediment could have helped build coastal wetlands if deposited in shallower environments. The sediment trapped in the forested wetlands of the Bonnet Carré Spillway has allowed for vertical accretion of land while neighboring forests not influenced by the spillway have suffered from subsidence and saltwater intrusion13. With the operation of spillways and river diversions, trade-offs between sediment delivery and decreased water quality exist. Future diversions are being designed to balance these trade-offs and maximize the benefits of river water to the environment. The use of large-scale pumping systems to drain land within levees has contributed to increasing rates of land subsidence. Large-scale pumping systems became widely used following the flood of 1927. The pumping of moist wetland soils has led to soil compaction, accelerating rates of subsidence within the levees and decreasing the elevation of land in relation to sea level3. The Mississippi deltaic plain is naturally settling at a rate of between 0.6 and 3.0 m (2.0 and 9.8 ft) per century as older layers of sediment are naturally compacted under the weight of younger layers18. Settling that occurs due to pumping within levees is a much faster process. Some residential sections of New Orleans were built upon drained marsh and require frequent pumping to remove storm water. These areas have experienced more than 1.3 m (4.3 ft) of subsidence from the time they were drained in the late 1910’s to 1989. In Jefferson Parish, residential areas of Kenner within the levee system are ~1.7 m (5.5 ft) below sea level, while the adjacent unleveed marsh is 0.2 m (0.8 ft) above sea level4. Natural subsidence rates combined with anthropogenic subsidence has led to a very high rate of isotactic adjustment in south Louisiana over the last century4 as the ground level changes (in this case, decreases) relative to sea level19. This sinking of land contributes to local mean sea level rise, along with circulation patterns, winds, and other local conditions. Eustatic, or global sea level changes result from changes in the volume of water in the world’s oceans, due to (1) the thermal expansion of existing water in the world’s ocean basins as it absorbs heat and (2) the addition of water from land-based sources—mainly ice sheets and glaciers, but also other smaller sources20. In 2007, the Intergovernmental Panel on Climate Change predicted an increase in global sea level rise by 0.18 to 0.59 m by 210021. However, that estimate is now considered conservative by some scientists. More recent predictions estimate an increase between 0.65m and 1.80m20. Considering isotactic adjustment, local climatic conditions, and eustatic sea level rise, coastal Louisiana is predicted to experience a 1.34 m (4.4 ft) increase in mean sea level by 2100, which is one of the highest predicted rates of mean sea level rise in the world22. Today, the greatest flooding threats for southern Louisiana communities are not from the Mississippi River, but from the Gulf of Mexico5. The loss of wetlands, coupled with subsidence and sea level rise, has greatly increased the vulnerability of southern Louisiana communities to coastal flooding hazards from tropical storms and hurricanes. With the exception of a few storms that hit coastal communities, such as the Isle Dernieres storm of 1856 that killed over 200 people and the Cheniere Caminada Hurricane of 1893 that killed 2,000, the impacts of storms in the late 18th and early 19thcentury on New Orleans and its suburbs were less severe than compared to impacts of 19th and 20th century hurricanes such as Betsy, Katrina, and Rita23,24. The increased loss of life and property can largely be attributed to the development of low-lying backswamp areas, increases in population and infrastructure, and increases in impervious surfaces3. Storms are also becoming more frequent. Louisiana tropical storm records dating from the 1860’s indicate that the 2000’s had more severe storms than any previous decade24. Climate change is believed to be the cause of increasing frequency and severity of major storms21. Flooding from more frequent and intense storms, coupled with increasingly vulnerable human settlements, threatens the resiliency of south Louisiana communities in the 21st Century25. Based on expanded knowledge of natural delta-building processes and experience with past flood-control failures, there is now a growing movement including scientists, engineers, planners, and citizens to change the way Louisiana addresses flood control. The focus of flood control is shifting from levees to strategic coastal restoration13, passive water management strategies, and non-structural flood mitigation measures, as evident in the 2012 State of Louisiana Coastal Master Plan26 and numerous books and scholarly articles published in the last decade3,5,27,28.29,30. Mounting evidence suggests that the long-term sustainability of coastal Louisiana is dependent upon our utilization of the natural land-building processes of the Mississippi River. 2Owen, D.E. (2008). Geology of the Chenier Plain of Cameron Parish, southwestern Louisiana, in Moore, G., ed. : Geological Society of America Field Guide 14, 27-38. 2008 Joint Annual Meeting, Houston, Texas, 5–9 October 2008. doi: 10.1130/2008.fl d014(02). 3Colten, C. E. (2005). An Unnatural Metropolis: Wresting New Orleans from Nature. Baton Rouge: Louisiana State University Press. 4Campanella, R. (2006). Geographies of New Orleans: Urban Fabric Before the Storm. Lafayette, LA: Center for Louisiana Studies. 5Day, J. W., Boesch, D. F., Clairain, E. J., Kemp, G., Laska, S. B., Mitsch, W. J., & Whigham, D. F. (2007). Restoration of the Mississippi Delta: Lessons from Hurricanes Katrina and Rita. Science, (5819), 1679. doi:10.2307/20035844. 6McPhee, J. (1990). The Control of Nature. New York: Noonday Press. 7Nyman, J.A. R.D. DeLaune, H.H. Roberts, & Patrick, Jr., W.H. (1993). Relationship between vegetation and soil formation in a rapidly submerging coastal marsh. Marine Ecology Progress Series (96), 269-279. doi:10.3354/meps096269. Nyman, J.A., R.J. Walters, R.D. DeLaune, & Patrick, Jr., W.H. (2006). Marsh vertical accretion via vegetative growth. Estuarine Coastal and Shelf Science (69), 370-380. doi:10.1016/j.ecss.2006.05.041. 8Independent Levee Investigation Team. (2006). Investigation of the performance of the New Orleans flood protection systems in Hurricane Katrina, Chapter four: History of the New Orleans flood protection system. National Science Foundation. 9Kesel, R.H. (2003). Human modification of the sediment regime of the lower Mississippi River flood plain. Geomorphology, (56), 325-334. 10Meade, R.H., & Moody, J.A. (2010). Causes of the decline of suspended-sediment discharge in the Mississippi River system, 1940-2007. Hydrological Processes, (24), 35-49. 11Marshall, B. (2013, May 08). Historic study to find out what the Mississippi River really carries to help coastal restoration. The Lens. 12Couvillion, B.R., Barras, J.A., Steyer, G.D., Sleavin, W., Fischer, M., Beck, H., Trahan, N., Griffin, B., & Heckman, D. (2011). Land area change in coastal Louisiana from 1932 to 2010: U.S. Geological Survey Scientific Investigations Map 3164, scale 1:265,000, 12 p. pamphlet. 13 Paola, C., Twilley, R.R., Edmonds, D.A., Kim, W., Mohrig, D., Parker, G., Viparelli, E., & Voller, V.R. (2011). Natural Processes in Delta Restoration: Application to the Mississippi Delta. Annual Review of Marine Science, (3), 367-91. 14Day, J., Hunter, R., Keim, R.F., DeLaune, R., Shaffer, G., Evers, E., Reed, D., Brantley, C., Kemp, P., Day, J., & Hunter, M. (2012). Ecological response of forested wetlands with and without large-scale Mississippi River input: Implications for management. Ecological Engineering, 46 (2012), 57-67. 15Lane, R.R., Day, J.W., Jr., Kemp, G.P., & Demcheck, D.K. (2001). The 1994 experimental opening of the Bonnet Carre Spillway to divert Mississippi River water into Lake Pontchartrain, Louisiana. Ecological Engineering, 17(4), 411-422. 16Mize, S. V., & Demcheck, D. K. (2009). Water quality and phytoplankton communities in Lake Pontchartrain during and after the Bonnet Carré Spillway opening, April to October 2008, in Louisiana, USA. Geo-Marine Letters, 29(6), 431-440. doi:10.1007/s00367-009-0157-3. 17LeBlanc, B. D., Franze, R., & Fletcher, B. (2011). Possible environmental impacts on Lake Pontchartrain by the opening of the Bonnet Carré spillway based on historical data. Retrieved from Louisiana Sea Grant website: http://www.seagrantfish.lsu.edu/pdfs/BCS_Fact_Sheet.pdf. 18Rogers, J. D. (2008). Development of the New Orleans Flood Protection System prior to Hurricane Katrina. Journal of Geotechnical & Geoenvironmental Engineering, 134(5), 602-617. doi:10.1061/(ASCE)1090-0241(2008) 134:5(602). 19Eustatic change. (2010). The Hutchinson Unabridged Encyclopedia with Atlas and Weather Guide. 20Board on Atmospheric Sciences and Climate (2010). Advancing the Science of Climate Change. The Washington, D.C.: National Academies Press. 21Solomon, S. (2007). Climate change 2007: The physical science basis, contributions of Working Group I to the Fourth Assessment Report of the Intergovernmental Panel on Climate Change. Cambridge: Cambridge University Press, 2007. 22Marshall, B. (2013, March 04). Graves: Louisiana’s coastal master plan can adapt to sea level rise. The Lens, republished by The Advocate. 23Mock, C. J., Chenoweth, M., Altamirano, I., Rodgers, M. D., & García-Herrera, R. (2010). The great Louisiana hurricane of August 1812. Bulletin of the American Meteorological Society, 91(12), 1653. 24Roth, D. (2010, April 8). Louisiana hurricane history. 25Syvitski, J. M., Kettner, A. J., Overeem, I., Hutton, E. H., Hannon, M. T., Brakenridge, G., & … Nicholls, R. J. (2009). Sinking deltas due to human activities. Nature Geoscience, 2(10), 681-686. 26Coastal Protection and Restoration Authority. (2012). Louisiana’s comprehensive master plan for a sustainable coast. Coastal Protection and Restoration Authority of Louisiana, Baton Rouge, Louisiana. 27Allison, M. A., & Meselhe, E. A. (2010). The use of large water and sediment diversions in the Lower Mississippi River (Louisiana) for coastal restoration. Journal Of Hydrology, 387(3-4), 346-360. 28Campanella, R. (2010). Delta Urbanism: New Orleans. Chicago, IL: American Planning Association; Planners Press. 29Lopez, J. et al. (2008). Comprehensive recommendations supporting the use of Multiple Lines of Defense Strategy to sustain coastal Louisiana, 2008 report (version I). Lake Pontchartrain Basin Foundation and Coalition to Restore Coastal Louisiana, New Orleans, Louisiana. 30National Research Council. (2006). Drawing Louisiana’s New Map: Addressing Land Loss in Coastal Louisiana. Washington, DC: National Academies Press.